McLaren driver, Jenson Button believes Mercedes and Nico Rosberg will be a threat at the front all year following their maiden win in the Chinese Grand Prix. 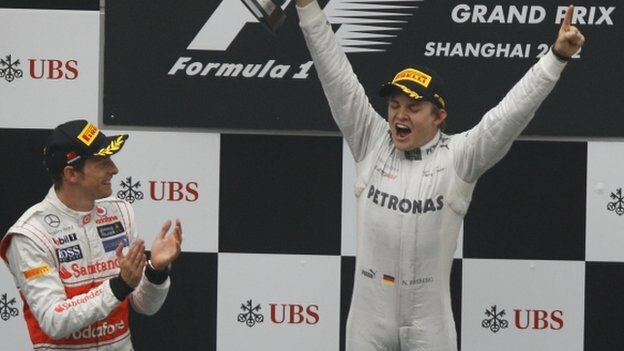 The German dominated in Shanghai to take his first victory at the 111th attempt and Mercedes' first since 1955. Rosberg led from the start, and an anticipated battle for the lead with Button in the final laps never materialised after the McLaren driver was delayed at his final pit stop. The two men's careers have been similar, in that Button had to wait for his 113th race to take his first win. in their previous incarnation as Brawn in 2009. Mercedes bought the outfit at the end of that season to return to F1 as a constructor for the first time since 1955. Button was one of many people in F1 to offer their congratulations to Rosberg. Mercedes team boss Ross Brawn also described Rosberg's performance as "stunning".